Released on BMOP Sound. 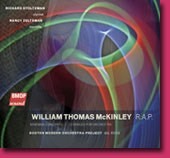 Recorded in 2005 with Boston Modern Orchestra Project, Gil Rose, conductor. Nancy Zeltsman, the outstanding soloist, sympathetically projects the various moods McKinley evokes in these 14 short movements. The BMOP orchestra is superb. An exhilarating collection of magnetic, life-affirming music.